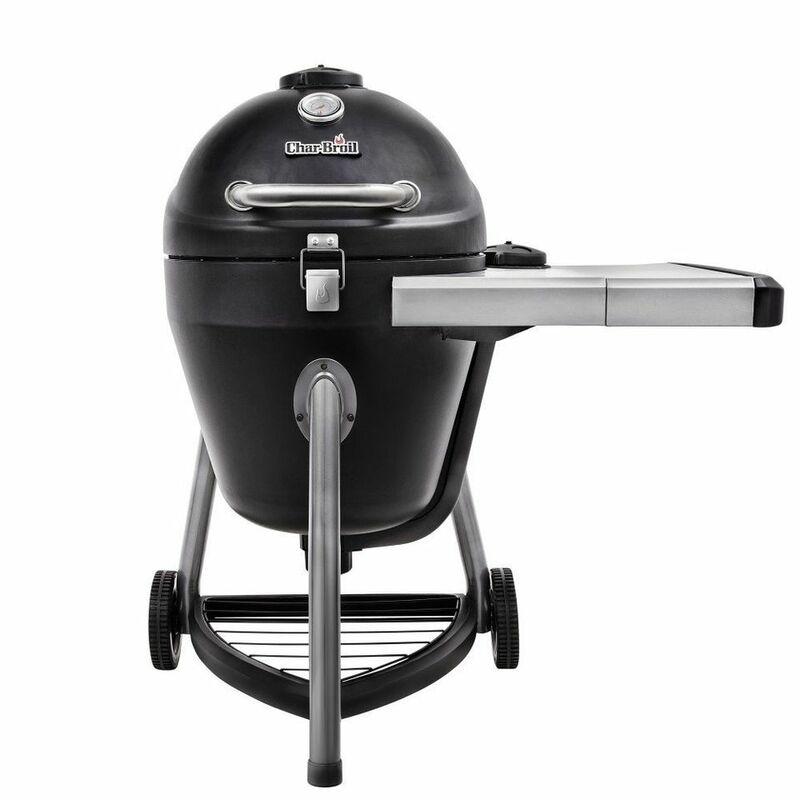 In the past few years, the Kamado style charcoal grill has gone from a niche product to a mainstream necessity. Known for building more affordable products, the Char-Broil Kamander grill is a metal version of the popular Kamado style. This makes it one of the least expensive on the market, and with Char-Broil's reach, the one that is bound to be a popular option. Listing the pros and cons is a helpful way to determine if this grill is worth buying. The Char-Broil Kamander Kamado is capable of hitting the kinds of high temperatures necessary for searing steaks while still being able to hold low and slow temperatures for long periods of time for smoking briskets. It is efficient in its consumption of fuel and the two vents allow for easy temperature adjustment. The 20-inch diameter cooking surface (327 square inches of primary cooking space) is large enough to hold a 20-pound turkey or a large brisket. In every way, this is a Kamado grill and it can do anything that any other Kamado grills can. Expensive and well cared for Kamado grills can last for a generation or two. This grill is probably not going to give you that kind of longevity. After a month, the test unit showed signs of corrosion on some parts. These will need to be oiled and may present problems in the future. The standout feature on this grill is both a representation of Char-Broil's ability to be innovative and their problems with quality control and quality components. The intake vent is mounted on the side table. Both top and bottom vents can be seen and adjusted simultaneously; bending or crouching is not required to reach the vents. These vents are large, numbered, and very convenient. The vents can be quickly adjusted to reach the desired temperature. The bottom vent is connected to the base of the grill via a duct. A screw on cap seals the bottom of the grill and provides for easy clean out. The problem with this convenient arrangement is that the vent, duct, and bottom mounting cap are made from cheap plastic. There is a high risk that this plastic will melt and damage the system. A common complaint about Char-Broil products is that this grill, like all their products, has a marketing sticker on the side table. These stickers are cheap and hard to remove. All in all, and considering the price, this is a working Kamado grill that can do it all, in a complete package. The grill works well and is easy to operate. No, it won't get passed down to the kids, but at this price, they can buy their own. The temptation when looking at a new Kamado grill is to compare it to the industry standard, the Big Green Egg. If the Big Green Egg made a 20-inch model and if it was equipped with everything that the Char-Broil Kamander comes standard with, it would likely cost over $1,500. The Egg has a durable ceramic shell and an attractive appearance. The Kamander has an insulated metal shell and a less attractive appearance.